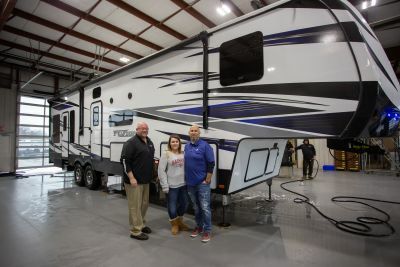 Not only will this terrific 5th Wheel Toy Hauler give you great outdoor family fun, but it sleeps up to 6 people, so everyone will sleep in real comfort. The roomy Queen bed in the master bedroom will enfold you in luxurious warmth and softness, whether lounging during the day or enjoying sweet dreams at night! 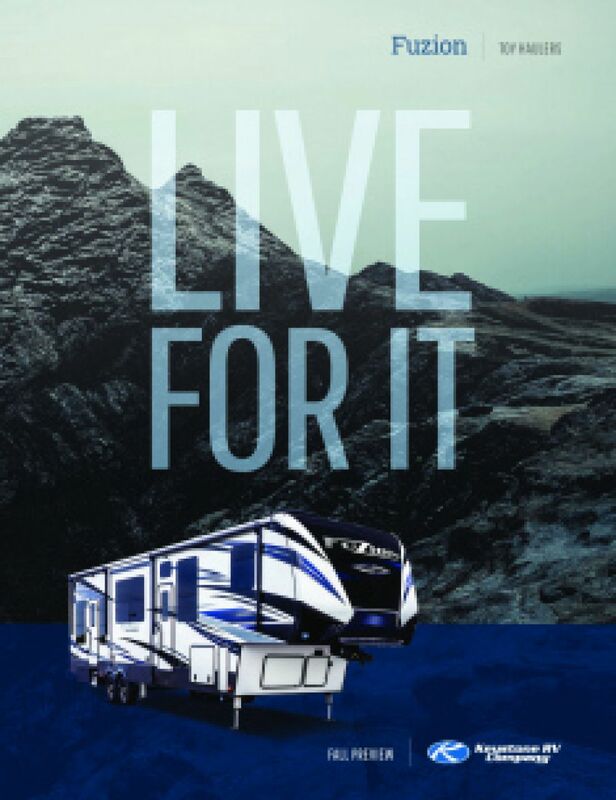 Camping has never been more convenient than in your 5th Wheel Toy Hauler. No hassling with outdoor campfires when you can fire up your 3 burner range cooktop. Store lots of great food in the 18.00 cu. ft. refrigerator so they're always at hand. When it's time to do the dishes, you'll have plenty of water in the 106 gallon freshwater tank! Another convenience with your 2020 Fuzion is the bathroom. With 60 lbs. of LP tank capacity, you'll enjoy hot showers in the privacy and comfort of your RV. The 88 gallon gray water tank and the 44 gallon black water tank, combined with the your Porcelain Foot Flush toilet means you'll avoid the noise and hassle of a campsite community bathroom. Don't worry about leaving your favorite outdoor toys behind! 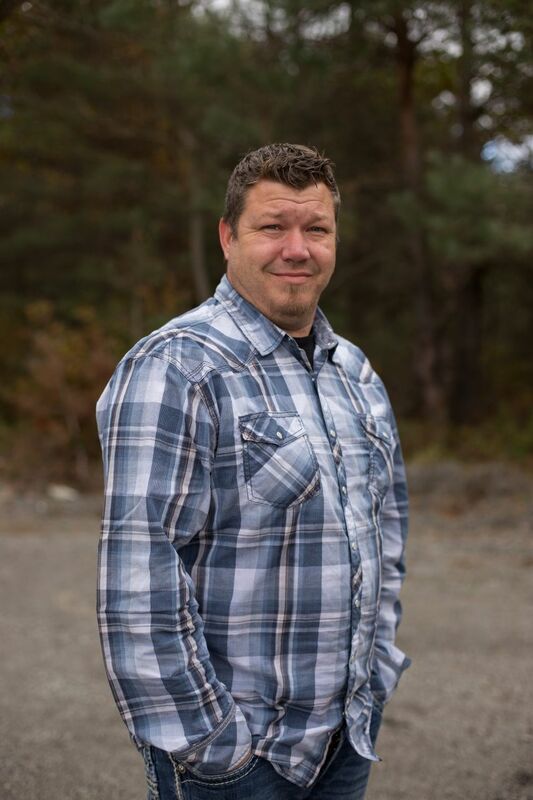 This Toy Hauler has a roomy 11' 0" long garage and a sturdy 3015 lbs. of cargo capacity! 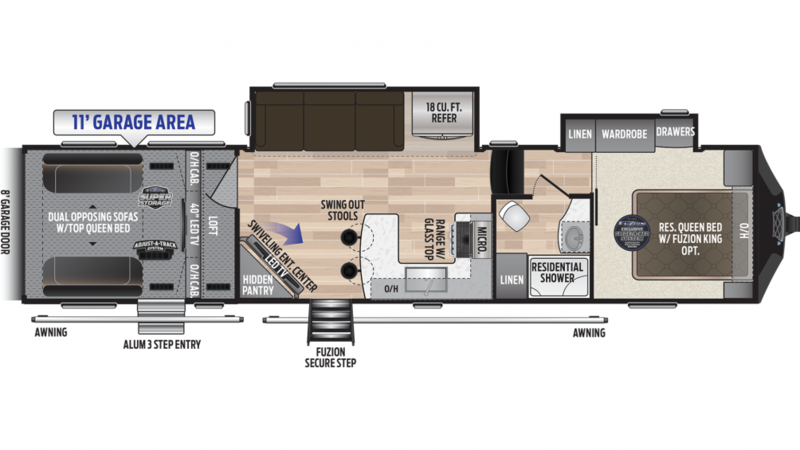 This RV offers lots of comfortable sleeping space for the whole family, especially with the great loft area built above! At night, the kids can snuggle in and sleep in cozy comfort after reminiscing about a full day's fun outdoors!